Wednesday March 14th 1894 I got down the stairs carpet ad that in the dining room before dinner with Josies help. Will and Leonard went in town in the morning for some hay left at the barn. In the afternoon he went back for some more things. Josie and I put down the oil cloth in the kitchen and carried the pictures from up stairs. We regulated the store room up stairs. It was late when we had supper. I had a letter from Mother. I read a little in the evening. There was a hard rain with sharp thunder & lightning Thursday March 15th 1894 It had cleared of like a spring morning. Josie and I did a big washing before noon. We worked all the afternoon hanging pictures and putting little things in place. Will and Leonard were working most of the day fixing the fence around the north orchard. I folded the clothes after supper and wrote a long letter to Mother. 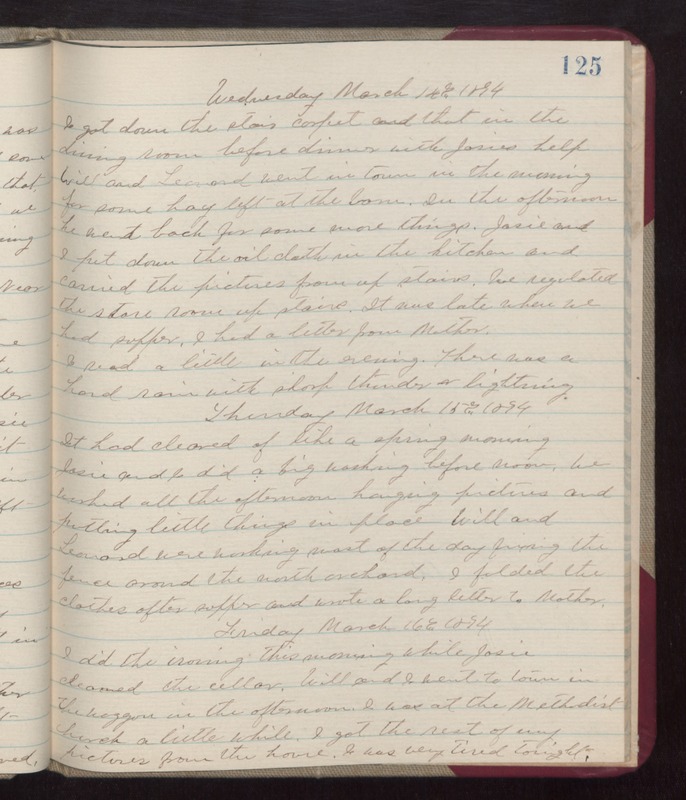 Friday March 16th 1894 I did the ironing this morning while Josie cleaned the cellar. Will and I went to town in the waggon in the afternoon. I was at the Methodist church a little while. I got the rest of my pictures from the house. I was very tired tonight.